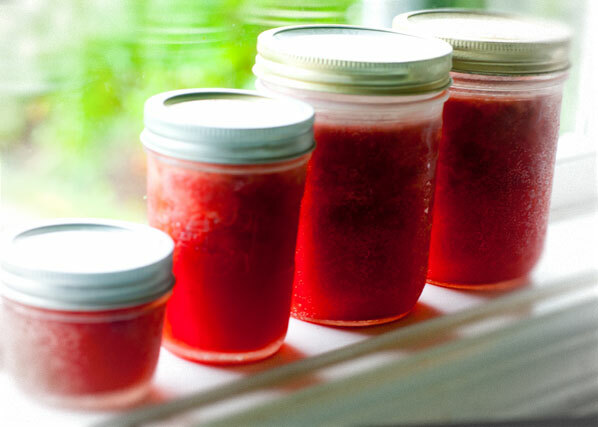 I have five pots of gleaming, ruby red freezer jam sitting on the window sill, and am feeling exceedingly proud of myself. I have smashed and compounded peak-of-the-season fruit from last year, and my inspiration to make them was because I needed the freezer space for this year’s incoming strawberry bounty, already jockeying for position, as I strong-arm the lid down on our smallish freezer. And since strawberries and chocolate are such a sumptuous combination, I needed to figure out a way to get that jam enrobed or molded into … something. Watching my younger son make a sandwich with the newly opened jar, spreading the thin and gloriously drippy jam on a piece of bread, we have an inspiration. I have managed to procure a packet of plain ice cream wafers from my cousin in Stirling, Scotland. I was having a very hard time finding plain wafers (the kind with no filling) in Vancouver. I initially wanted them to have a go at making Kit Kats. 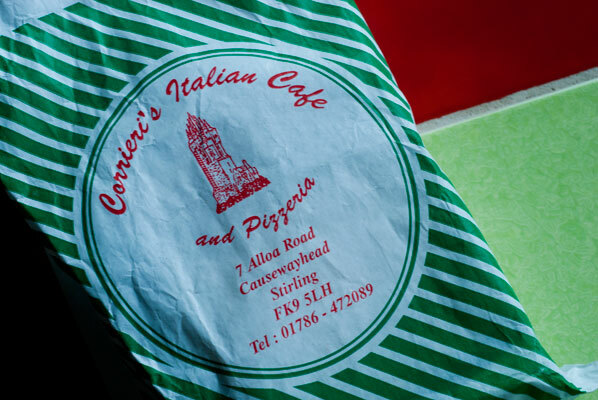 My cousin’s favorite neighbourhood Italian restaurant and gelateri came to the rescue. If this seems like an awfully complicated way to get supplies, I would agree, but, as I happened to be visiting Anne, we stopped in at Corrieri’s and they, somewhat amused, were kind enough to load me up with enough wafers to take back to Canada, and to keep me going for the foreseeable future. They initially refused payment, but eventually let me pay 50 pence for the big box. Mille Grazi, Corrieri’s! I am having one of those “I know I am turning into my mother” flashbacks, as I remember my own Mum, packing some ice cream wafers back from a trip to Scotland years ago, determined to make homemade nougat wafers. These oh-so-sweet and delicious treats are to be found everywhere in Scotland and England, and cannot be eaten neatly, as they are composed of two wafers sandwiching a mallow filling, edged in chocolate. You take this, put a slab of vanilla ice cream on top of it, and top it with a plain wafer. Oh yeah. 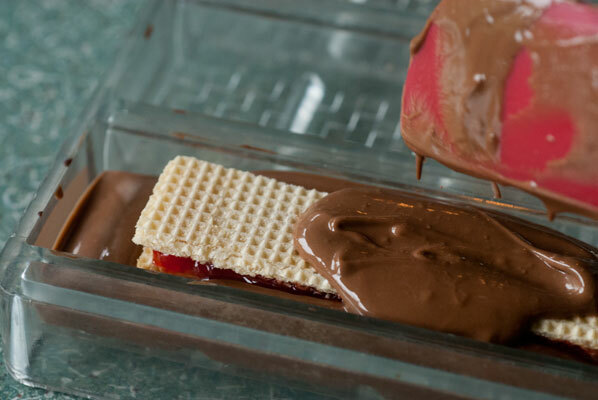 I have nothing so squishy in mind, but the sight of my son’s strawberry jam and peanut butter sandwich has given me an idea for a chocolate bar: the Milk Chocolate PB and J wafer. My initial idea is to mold them in my new favorite poly-carbonate chocolate bar mold, which worked so successfully last week. Either my tempering is becoming more consistent – or more likely – this mold releases easily because of the large, flat, relatively plain surface area and sheer weight of the mass of chocolate in the mold. I will need to cut the wafers in half, to have enough clearance on both sides of the mold, to ensure the chocolate will fully cover. 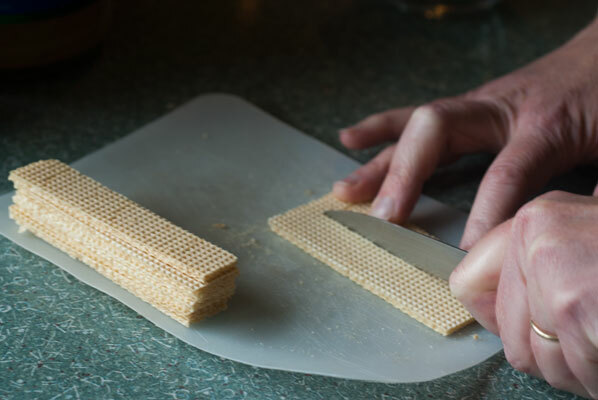 The wafers have a convenient grid of tiny squares on their surfaces, and I use this to precisely count to the centre of each one, before cutting it. This really is over-kill, as the whole thing will be covered in chocolate, but they do turn out well – like a stack of miniature two-by-fours. 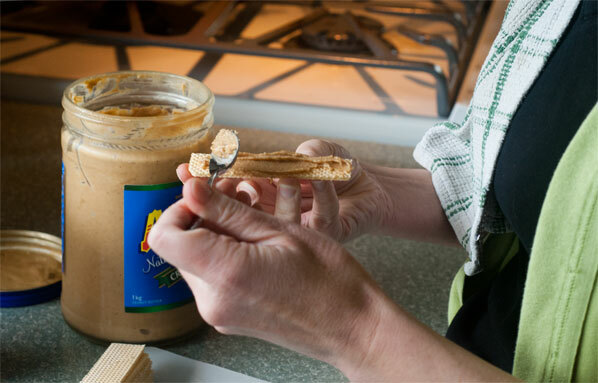 Working quickly, I coat the surface of one piece of wafer with peanut butter. I soon find out this layer must be really thin, as most of it squishes out the sides. This is just straight up natural peanut butter, as opposed to a peanut butter cup filling stiffened to piping consistency with icing sugar and butter. 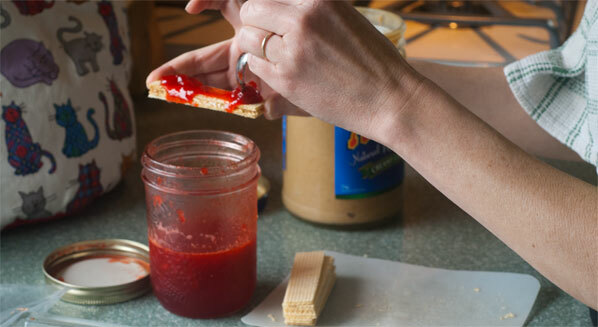 A wafer goes on top of the peanut butter, and is followed by an equally thin layer of jam. I now have a stack of three wafers plus two fillings, which is looking quite tall as I glance at the mold. Will it fit? I refrigerate the stacked wafers, and temper the milk chocolate. I am back to the tabliering method, rather than seeding, this week. This is either because I am fickle and am tired of the constant stirring and temperature checking involved in seeding, or maybe I am actually feeling a little more confident in my ability to tablier, especially now that I have learned the vital importance of not answering the telephone or for that matter, any questions at all, while the chocolate is on the marble slab. Tabliering is not the time to multi-task. I get the initial layer of chocolate into the mold, give the mold a good bang on the counter-top to release air bubbles, then carefully drop in the stacked wafers. I can see already that the first one is too tall, and sticking out of the top of the mold. 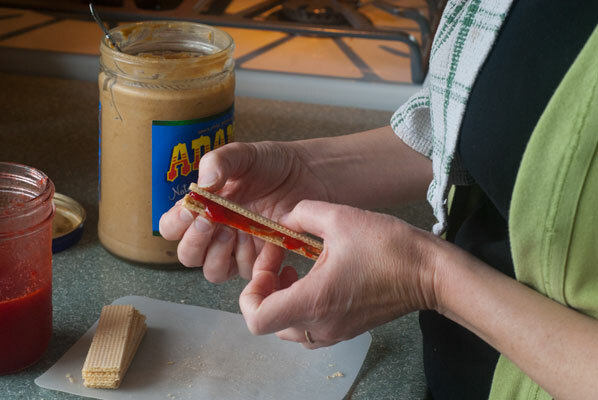 Trying not to panic, I leave that one as it is, but remover the peanut butter layer from five of the remaining stacks, leaving just wafers and jam. 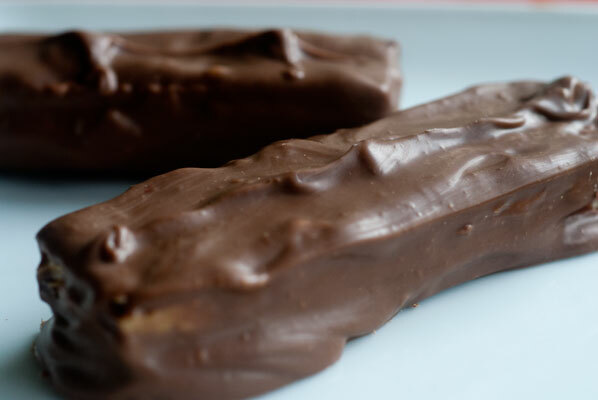 This seems to work well, and I am able to fill in the molds with chocolate, and set them off to dry. I now have a go at enrobing the remaining stacks, which enables me to have the stacks as tall as I like, but does mean I have to work quickly, as they are quite slippery, large and cumbersome. Oh, for an enrobing machine with a belt! I make a little design down the centre of the tops, mostly to cover any flaws. They look a little bit “rough and ready”, but have actually turned out prettier than I imagined they would. The molded bars pop out obligingly, even the “too tall” one, and although it looks odd, balancing on its smaller-than-the-mold bottom, there are no naked bits of wafer sticking out. When we cut into them and sample them, my partner nods in approval. 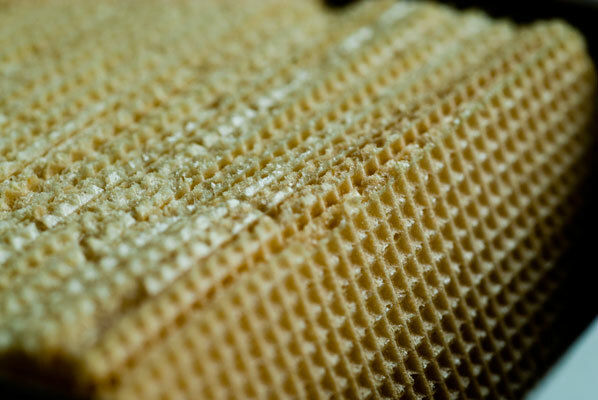 I like the texture of the wafer, as well, but am not so fond of the peanut butter. As it turns out, I think the simpler jam and wafer filling it much nicer with the milk chocolate. 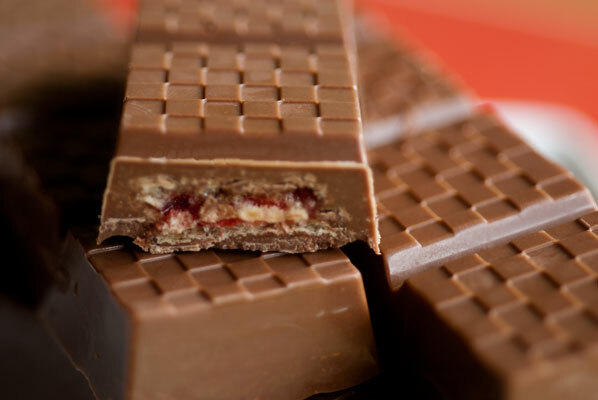 I like the biscuit-y crispiness, and the tang of the strawberries, which balance the sweetness of the milk chocolate. Simple, but nice. And a name? I am thinking: the “Just Jam”.